British Summer Time starts this weekend, and you’re no doubt as delighted as I am to be losing an hour of sleep on Sunday. Especially as it’s also Mothers’ Day!!! Every year I get lots of questions asking for the best way to handle the clocks going forward. And more importantly how to minimise the impacts on children’s sleep. It can be a frustrating time when you’ve got your child into a good routine and then you have to adjust their schedule. But with a few tweaks, it’s possible to help them adjust without too many issues. So what’s the best way to handle the clocks going forward? My best advice for children to help them with the change is to split the difference with the old time and the new time. How does that work? If you have a child that does not nap and normally goes to bed at 7pm, you would put him to bed at 7:30pm on Sunday night, the first night of the time change. Do this for 3 nights, putting him to bed 30 minutes later than normal, then on the 4th night put him to bed at the normal time. If you have a toddler aged one or older, on Sunday the first day of the time change, put him down for his first nap 30 minutes later than normal. So if he naps at 9:30am, you would put him down at 10am. You would do the same with the afternoon nap if he takes one. For bedtime, if his normal bedtime is 7pm, put him down at 7:30pm. Do this for 3 nights after the time change. Then on the 4th night, put him to bed at 7pm and on the 5th day move nap times back to normal time. If your baby’s bedtime is around the same time every day, move bedtime 15 minutes earlier each night. So the first night, if bedtime is normally 7pm you would put him down at 7:45pm, the second night 7:30pm, and so on. In four nights you should be back to 7pm. If their bedtime is not predictable (0-6 months old) simply jump to the new time on Sunday night. Another tip is to darken your child’s room. Your child may wake early with the sun rising so early in the morning. They may also struggle to fall asleep while it’s still light outside. So darkening the room can be very helpful. Even though there are extra hours of daylight, children still need the same amount of sleep. It may take children and babies a bit more time to fall asleep, and this is normal. This is because they won’t be quite as tired. 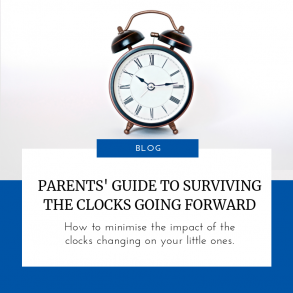 It usually takes a week for children and babies to completely adjust to the new time. For some children it can take up to a month, but be patient and consistent, it will happen. If you would like some support with the clocks going forward, or any other sleep issues, please get in touch. Just follow the link to book a call with me, or email me at katy@slumbertots.com.